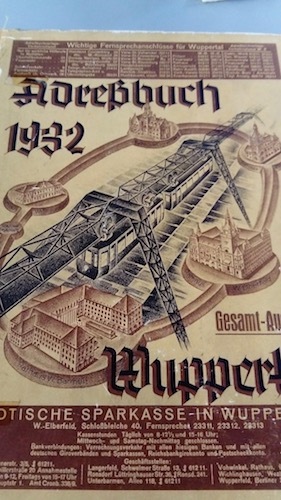 In April we were invited by the Begegnungsstätte Alte Synagoge (Meeting Place Old Synagogue) in Wuppertal to attend the presentation of a book about the former Jewish citizens of Wuppertal (among which Sylvia's greatuncle Max Heumann, his wife Berta and his nephew Albert). 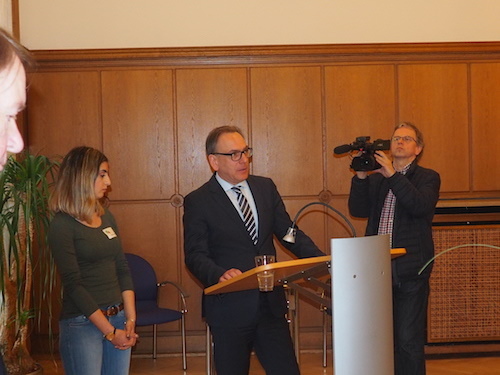 Not only that; a 4-day programme has been organised for a group of about 20 descendants of several Wuppertal families. 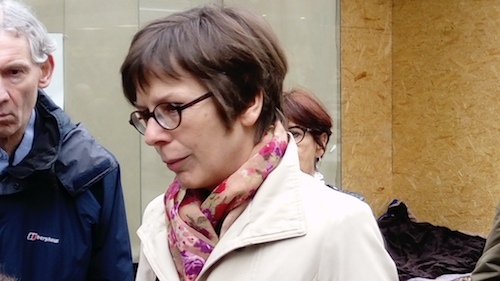 In the group were even two persons who, as a child, had lived in Wuppertal themselves and left "just in time". We arrive the night before the event. The weather is so nice that we can have an early Italian dinner outside. 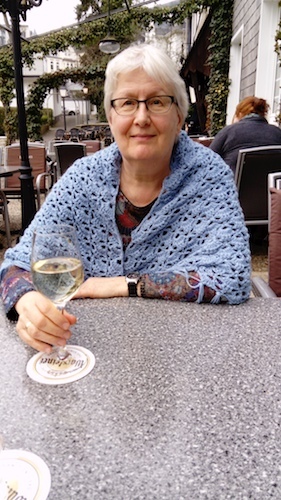 The shawl that our dog sitter Helen has crocheted comes in handy! 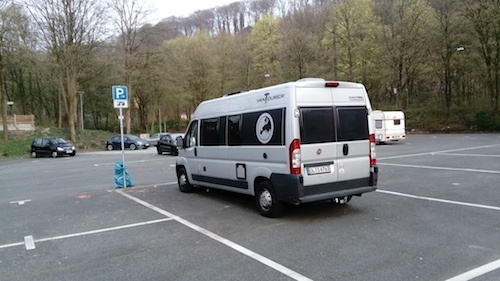 Wuppertal has a dedicated motorhome place where we park for the next few days. 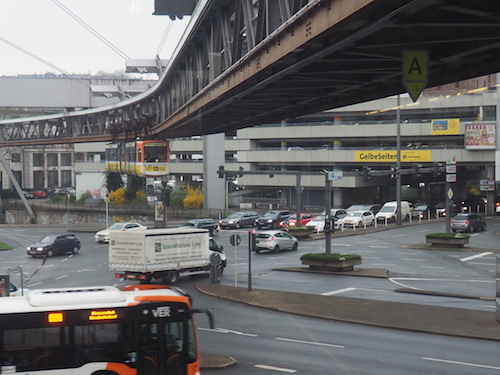 A stop of the famous Schwebebahn is nearby (and also a motorway but we slept well here). 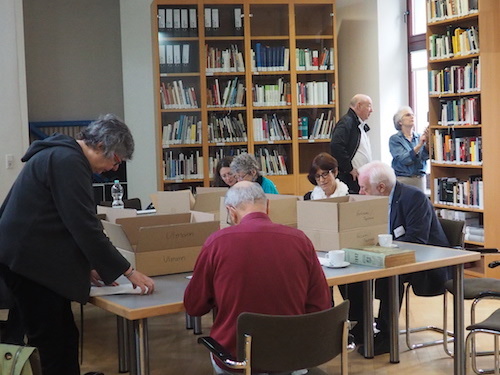 The next day the programme starts in the Begegnungsstätte Alte Synagoge which has been built on the spot where the synagogue used to be until November 1938. 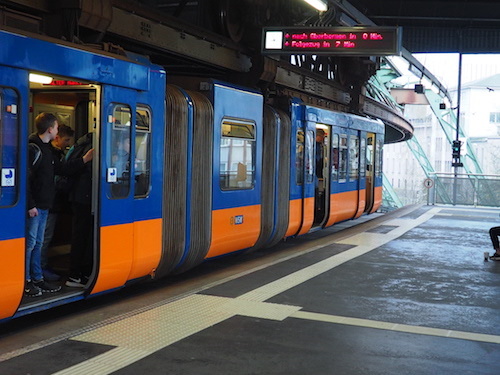 Alas, the Schwebebahn is on strike today but we can reach the Meeting Center by taxi. After a warm welcome we first visit the educational museum upstairs. 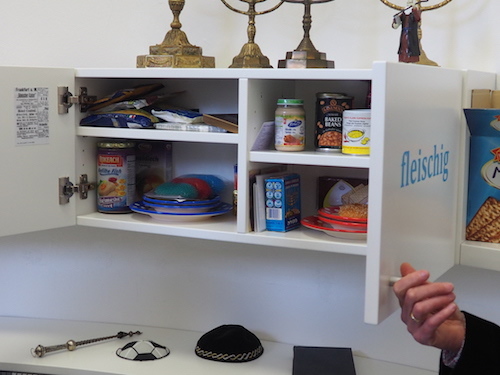 We particularly like this way of explaining the separation between dairy and meat in the Jewish kitchen. 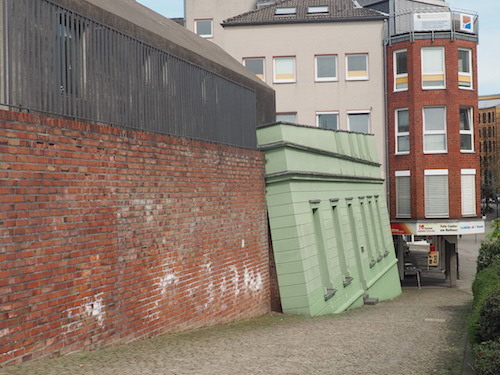 Explanation of where the premises of the old synagogue have been. After a delicious lunch, to our surprise all participating families are presented with a brown cardboard box. 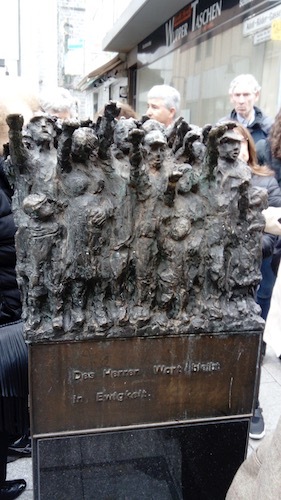 It contains all that is known at the Meeting Place about their relatives. Our box is rather empty, but still contains some new facts. Among the treasures of the library are some pre-war address books. 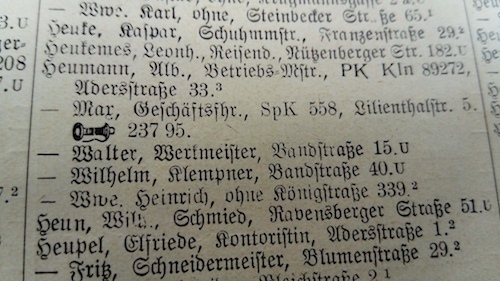 They show that Max Heumann has been the owner and his nephew Albert has been the manager of the Chriso company as well as their home addresses. Chriso used to manufacture metal household aids. The Heumanns held a patent on a manual potato peeler. 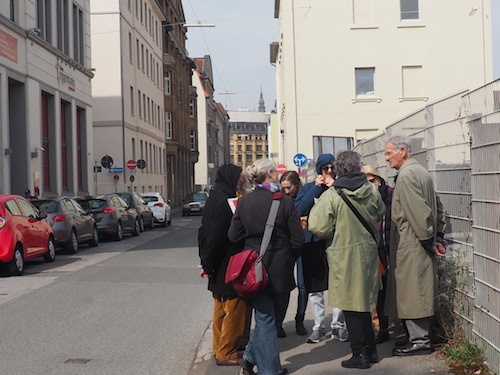 Part of the group on a guided tour in a part of Wuppertal-Elberfeld where many (well-to-do) Jews lived before WWII. Too long for Ernst (with his recent leg surgery) so he stays behind to do some more research in the library. 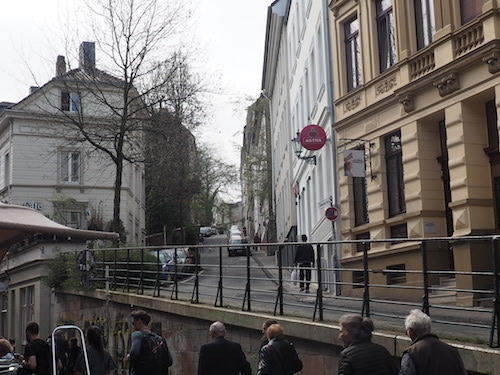 Next day the Schwebebahn runs again and we all travel to Barmen. 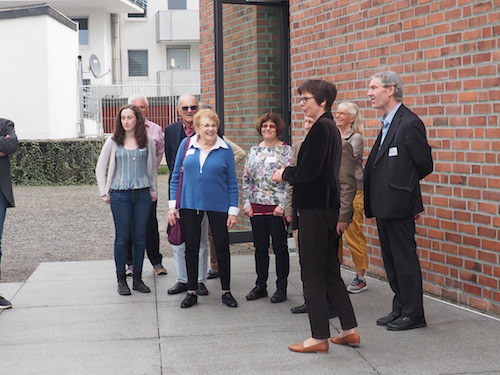 On the way to the Synagogue in Barmen, Ulrike Schrader, director of the Meeting Place, explains to us the history of this statue: it illustrates how the majority of the population silently followed the national-socialist leaders. 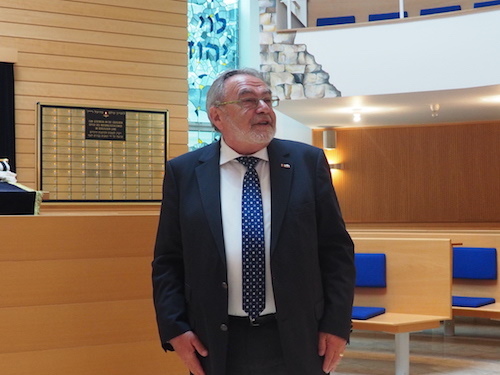 After another delicious lunch in the kosher café next to the synagogue, Leonid Goldberg, the chairman of the Jewish community, shows us the beautiful new Synagogue. Next stop is the Town Hall of Barmen, where we meet the mayor. 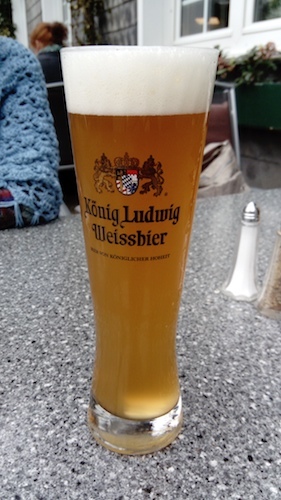 Every visit is translated from German to English for everybody to understand. The Press is also present. Apart from our group there are a lot of other attendants. 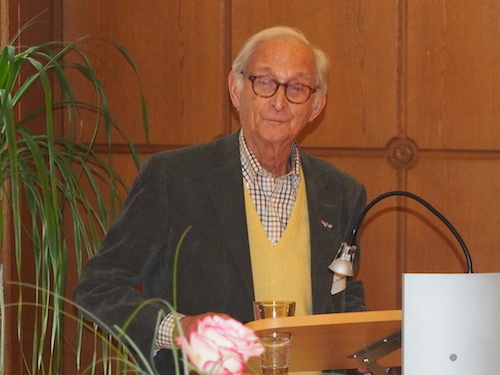 Wolf Kotek, who was born in Wuppertal and lived there until the age of 9, speaks about his youth. Wolf, a physician, now lives in Rotterdam, the Netherlands. We have known him and his wife for a long time and are happy to meet them again. 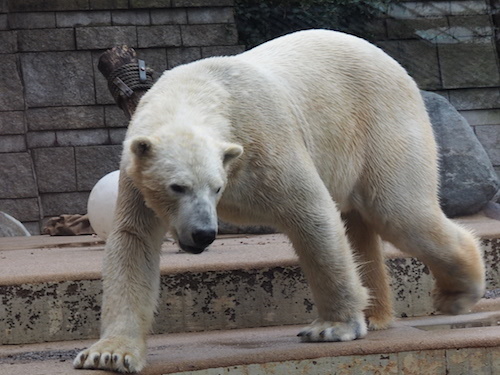 Wolfs cousin Lily, who now lives in the United States, has also come to take part in the visit. We have a few hours off and plan to take a rest in our camper van. 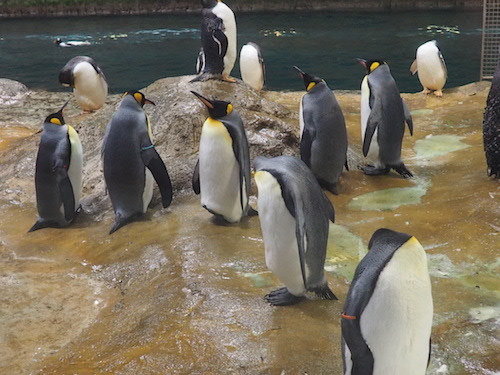 When we get off the Schwebebahn, the weather is so nice that we decide to make use of our free tickets to the Zoo instead. In hindsight not quite a wise decision, because the hilly terrain proves to be too much for Ernst's leg after his recent achilles tendon operation. 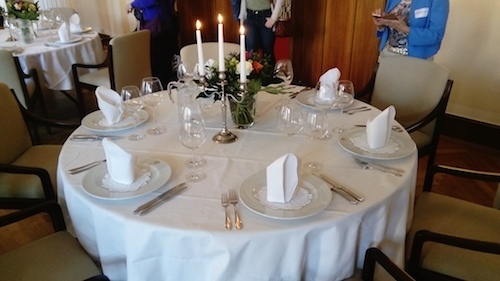 In the evening we have a festive dinner with guests and volunteers of the Meeting Place. One of the board members takes us back to our camper van afterwards since by now it is raining cats and dogs. 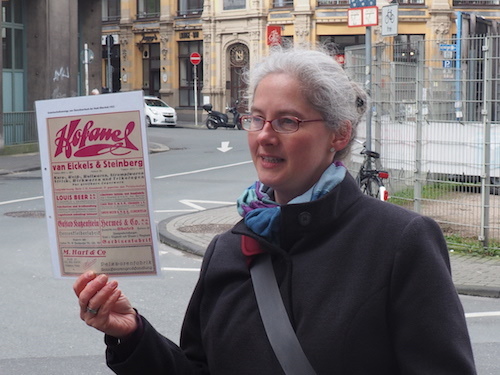 Thursday brings another guided tour, this time led by Christine Hartung, senior staff member of the Meeting Place. We walk to the Hofaue area where my greatuncle once lived. 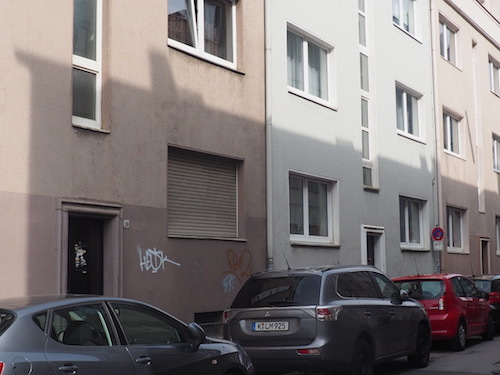 Bembergstraße 8 (one of his former addresses) is now a new-build. 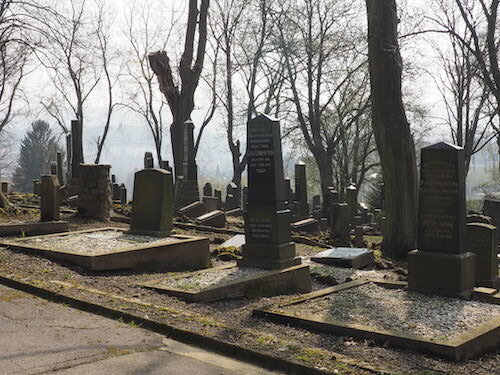 In the afternoon Ulrike takes us by bus to the Weinberg Jewish cemetery in Elberfeld, while Christine accompanies others to the cemetery in Barmen. 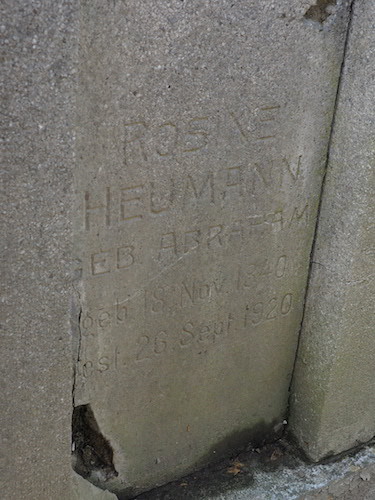 In Elberfeld we find the grave of my Great-Grandmother Rosina Abraham. After almost 100 years we may have to do some repairs. It is good to be able to leave a little stone on her grave. 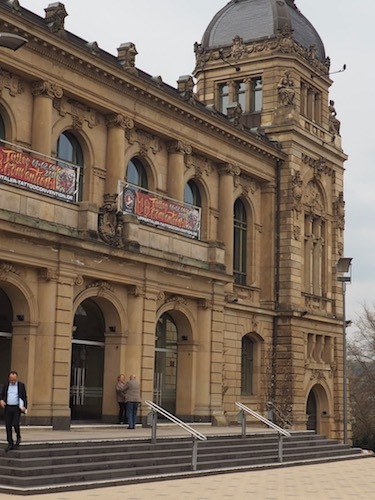 The last event of the week is the presentation of the book "Antworten aus der Emigration, Briefe und andere Quellen Jüdischer Flüchtlinge aus Wuppertal in der Sammlung Föhse" by Ulrike Schrader in the impressive historic Concert Hall (Stadthalle) of Wuppertal. Afterwards we receive our own copy of the book. An English translation is due to be published in late 2018. The next morning we say our goodbyes at a last cup of coffee or tea and travel home. En route we do some shopping in Dortmund. 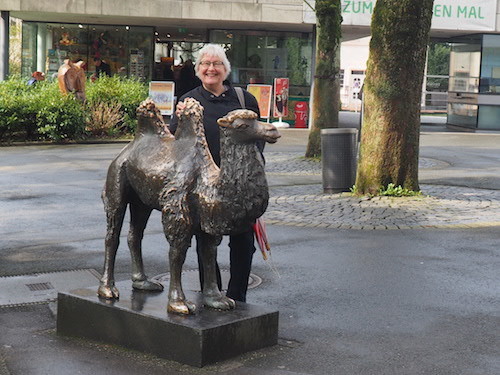 This city is home to many modern sculptures. 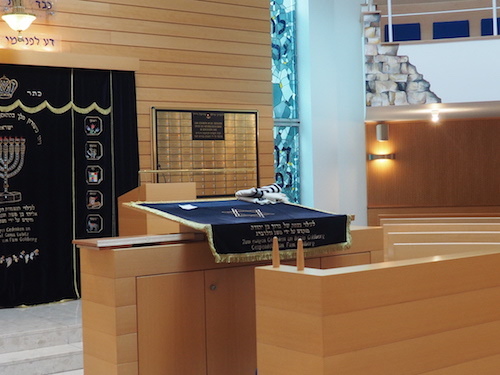 On April 15th was the annual commemoration of the liberation of Bergen-Belsen. 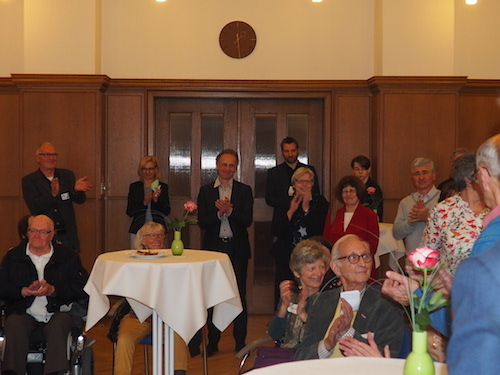 Ernst attended as a board member of the Jewish community of Oldenburg. 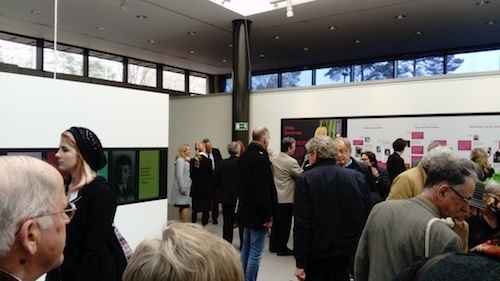 After the commemoration ceremony, the extremely impressive exhibition "Children in the Bergen-Belsen Concentration Camp" was officially opened.